Attics and crawl space are important sections of the house, and yet most homeowners neglect these functional areas until something serious happen. Timely inspections and regular maintenance not only preserves the integrity of homes and buildings, but it also helps to spot minor problems before they become major. 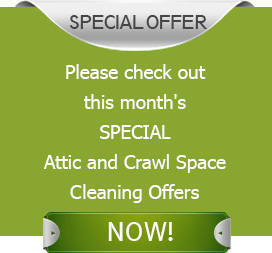 Since tackling these tasks requires professional help, let Quartz Solutions take care of all your attic and crawl space cleaning needs with innovative and cost effective strategies. 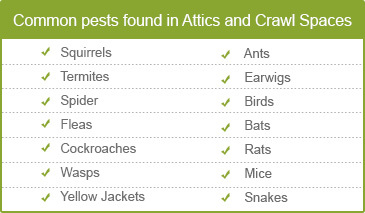 If left unchecked, the damage in attics and crawl space will just grow and become more expensive. It might even compromise your family’s health, safety and well-being. Improperly installed insulation and faulty duct systems can cause energy bills to shoot up. Also, harmful microbes can sweep right across your living space. The presence of insects like wasps, roaches and termites can bring harm, disease and disaster to your home. Animals, such as rats and bats have the potential to create havoc, tear up insulation and wiring, spark fires and leave behind a lot of waste. Excessive moisture breeds mold and mildew that can be hazardous to breathing if it is airborne. A moist environment prompts wood decay, triggering expensive structural damage. Step one towards a safer attic and crawl space is a proper inspection of the property. It includes testing for radon gas, a known carcinogen. Our team of skilled technicians will show up at your home or commercial establishment at no cost, to evaluate the condition of the property and identify any problems. They will recommend the best cleaning solutions to get rid of any issues, while working with you to help meet your budget. We know that you’ll want to adhere to your price range. Our goal is to provide superior quality of services, the finest solutions and materials, at the most competitive rates in the market. We care deeply about Pequannock Township, Morris County, NJ, and the well-being of this wonderful community. At Quartz Solutions, we strive to deliver high-quality cleaning solutions to keep attics and crawl spaces in outstanding condition. We want to help keep homes safe, secure and comfortable for the 14,000 odd residents of Pequannock Township. Get in touch with Quartz Solutions today 973-536-1013 for a free inspection and consultation.